This document is about a phenomena known as data mining, analytics that you and your company can benefit from by exploring your own statutory inspection and certification data and using it to manage and ensure compliance. All the data can be found in the Lifting and Handling Services (LHS) Statutory Inspection programme called CLASS. The Value of Data Analysis within Statutory Inspection. By collecting, categorising and analysing information it empowers you and your company to highlight materials handling defects, identify gaps in compliance, improve procedures and safety. Provide efficiencies with real cost savings and benefits, and will help to reduce or even prevent incidents and accidents. Can the information improve procedures and / or make savings to your business? Can the data collected benefit employee’s health and Safety? Can the data collected, improved procedures and benefits in Health and Safety reduce your insurance and other related costs. In 1990 LHS developed our own inspection and certification management software programme which we called CLASS – an acronym for Computerised Lifting and Statutory Services, since then we have won many awards for the programme including the “Recognition of Excellence” from the Irish Maintenance Society and the “Ministerial Millennium Award for Safety Projects” from the Health and Safety Authority. The CLASS system was used in the Irish courts 1996 when LHS assisted a multinational client in defending a claim against their company. A key factor that won the case was 5 years of data produced through the CLASS inspection programme, brought as evidence proving compliance. This case confirmed to us the value of maintaining a detailed history of inspection and preventive maintenance. To ensure that everything was captured from one inspection to the next. To ensure all the repairs were catalogued and carried out. This simply did not make financial sense and sometimes the value of maintenance or preventive maintenance, even the inspection and certification of equipment, can be seen as an expense with little importance and a hassle or a disturbance to production. That is of course until the machine breaks down or we are looking for information to defend our companies against a claim. Lifting and Handling Services statutory inspection service delivers all the information you need in a series of 9 reports. Furthermore we specialise in data driven analysis and optimisation of your equipment and individual plant items. In simple terms we unlock and exploit answers held within the data. Can you say your current statutory inspection and certification process is delivering value to your organisation, if not contact LHS and we can take your company to the next level. To prove this fact I would like to present two case studies’ demonstrating the value of a good database and good report structure. We offer the following case study as proof that when you read the data and use the data there are savings to be made, furthermore value, efficiencies and lessons for the future can be taken from your data. This client is in retail with nationwide operations, an active database used for financial purposes only (with a good history of repairs etc). They employed a contractor to maintain a fleet of powered pallet trucks, order pickers, pallet stackers, fork trucks, etc.. The Statutory Certification had been part of the maintenance remit. However; LHS were appointed in 2012 to carry out the statutory examination and certification of their plant. This case study started as a safety issue and ended as a financial one. LHS carried out an inspection and certification of equipment over a number of site visits. The initial results identified a number of faults, in particular a fault on drive wheels. Upon completion and collection of the nationwide inspection data it showed that the fault (flat spots and excessive wear) was due to issues such as trucks being driven too fast, braking / cornering too hard, stopping suddenly etc. and a design issue that could be resolved by the manufacturer. A recommendation was made to the client for a refresher training programme for drivers and a monitoring system. We also advised that they discuss with the supplier of the trucks the replacement of the drive wheels with a harder compound wheel or a review of the braking system which could result in considerable savings across the fleet. If this was not possible; a second recommendation was for the client to purchase their own stock of wheels which would also reduce their cost. In summary what started as a safety issue ended as a financial one. It is obvious that there are savings to be made by reading and analysing the data. Another lesson is that if it is a statutory regulation to have equipment tested, surely it is an opportunity to make the most of the data instead of thinking of it as merely a tick box exercise. The maintenance of the patient handling equipment was carried out by the nationwide equipment suppliers. Individual databases may have existed but the client had no access to the data. The Statutory Certification of the equipment was historically part of the maintenance provided by the equipment suppliers. LHS was appointed in 2014 to carry out the nationwide statutory examination. Again this case study started as a safety issue and ended as a financial one. LHS carried out a nationwide statutory inspection and certification of all the equipment over a number of site visits. Whilst carrying out the first equipment inspection we also built the national database. Information on all equipment in each site was gathered: description, location, plant item details, make and model. Results from the first inspection were recorded and this information acted as a marker on how equipment was performing nationwide. The results were startling. The data showed some manufacturer’s equipment performed much better than others. So much so that it lead us to carry out a major review of the equipment. One plant item outperformed all the other equipment. When our review was completed and we took all the information to our client. Again the reports proved the current state of the equipment and its requirements for the future. One of those reports was a graph of budgets for spare parts and down time. Do you think we have gone too far? Have you ever considered that a statutory inspection could deliver so much information that it will allow you to formulate your future requirements in terms of the type of equipment that should be purchased. Our client clearly could see the power and benefits the data can deliver. In summary; again what started as a safety issue ended as a financial one. It is obvious that there are major savings to be made by reading the data. The interesting point in this Case Study is although there were no other databases available there was a set of accounts. The lesson learned from this case study is that the CLASS programme can deliver so much more information from the statutory inspection in terms of technical assistance and empowering decisions on purchase of equipment, even more so when there are multiple sites nationwide. The information gathered can assist in reviewing one plant item against another, track its performance and calculate future requirements in terms of downtime, parts and cost. In such a vulnerable sector this is crucial information. The information can give you indisputable information that can be fed back to the manufacturer to prove your case for replacement parts or replacement of a plant item. I believe that we accept the failure of medical equipment such as patient handling equipment too easy and this is proven by the fact that there are several web sites informing the user of failures or even catastrophic failures which has caused injury. With our clients continued agreement and assistance it is our companies intention to give the technical assistance required and the data to back up and prove the value and efficiency of each piece of equipment that comes under the statutory and certification remit and in this case to bring the Medical world into the industrial world. 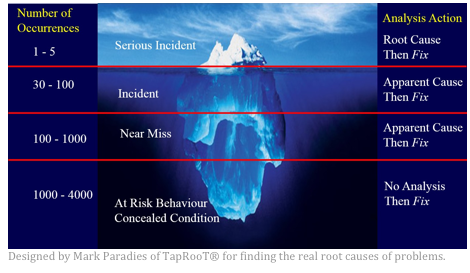 We have all heard and understand “The Iceberg Effect” estimating the ratio of direct and indirect costs relating to injuries after an accident are up to 20 to 1. Make a small change in your procedures to include data analysis (CLASS Inspections) and you may receive a 4 fold delivery in Safety Efficiency and Value. If you understand the value of data and that it can deliver efficiency you will realise that you can make safety a Profit Opportunity. I believe that Lifting and Handling Services, CLASS inspection and certification program delivers Safety Efficiency and Value, please contact us at 045-868342 for more information. Read what our clients have to say about us, Customer testimonials.